Sarajevo is the capital and largest city of Bosnia and Herzegovina, with a population of 305,242 people in the four municipalities that make up the city proper, and a metro area population of 423,645 people in the Sarajevo Canton as of August 2009. It is also the capital of the Federation of Bosnia and Herzegovina entity, as well as the center of the Sarajevo Canton. Sarajevo is located in the Sarajevo valley of Bosnia proper, surrounded by the Dinaric Alps and situated around the Miljacka river. The city is famous for its traditional religious diversity, with adherents of Islam, Orthodoxy, Catholicism and Judaism coexisting there for centuries. Due to this long and rich history of religious diversity and coexistence Sarajevo has often been called the "Jerusalem of Europe". Lonely Planet has named Sarajevo as the 43rd best city in the world. Although settlement in the area stretches back to prehistoric times, the modern city arose as an Ottoman stronghold in the 15th century. Sarajevo has attracted international attention several times throughout its history: In 1914 it was the site of the assassination that sparked World War I, while seventy years later it became the host city of the 1984 Winter Olympics. More recently, Sarajevo underwent the longest siege in modern military history during the Bosnian War. Today the city is recovering and adjusting to a post-war reality, as a major center of culture and economic development in Bosnia and Herzegovina. Sarajevo was also the first city in Europe and the second city in the world to have a full-time operational electric tram network running through the city, the first being San Francisco. In December 2009, Lonely Planet listed Sarajevo as one of the top ten cities to visit in 2010. Archeologists can safely say that the Sarajevo region has been continuously inhabited by humans since the Neolithic age. The most famous example of a Neolithic settlement in the Sarajevo area is that of the Butmir culture. The discoveries at Butmir were made on the grounds of modern day Sarajevo suburb Ilidža in 1893 by Austro-Hungarian authorities during the construction of an agricultural school. The area’s richness in flint was no doubt attractive to Neolithic man, and the settlement appears to have flourished. The most stunning aspects of the settlement are the unique ceramics and pottery designs which identified the Butmir people as a unique culture. This was largely responsible for the International congress of archeologists and anthropologists meeting in Sarajevo in 1894. The next prominent inhabitants of Sarajevo were the Illyrians. The ancient people that considered most of the West Balkans as their homeland had several key settlements in the region, mostly around the river Miljacka and Sarajevo valley. The Illyrians in the Sarajevo region belonged to the Daesitiates, a war-like people who were probably the last Illyrian people in Bosnia and Herzegovina to resist Roman occupation. Their defeat to the Roman emperor Tiberius in 9 A.D. marks the start of Roman rule in the region. The Romans never built up the region of modern day Bosnia that much, however it is known that the Roman colony of Aquae Sulphurae existed on top of present day Ilidža, and was the most important settlement of the time. After the Romans, the Goths settled the area, followed by the Slavs in the 7th century. During the Middle Ages Sarajevo was part of the Bosnian province of Vrhbosna near the traditional center of the kingdom. Though a city called Vrhbosna existed, the exact settlement of Sarajevo at this time is debated. During the high Middle Ages various documents make note of a place called “Tornik” in the region. By all indications however, “Tornik” was a very small marketplace surrounded by a proportionally small village not considered very important by Ragusan merchants. Others meanwhile say that Vrhbosna was a major city located in the middle of modern day Sarajevo. Indeed, Papal documents say that in 1238, a Cathedral to Saint Paul was built in the city. Even disciples of the famous Saint Cyril and Saint Methodius had stopped by the region, establishing a church at “Vrelobosna”. Whether this city was indeed located at modern day Sarajevo or not, an important city called Vrhbosna did indeed exist at the time and the region was of great importance. The settlement VrhBosna existed in the valley as a Slavic citadel from 1263 until it was occupied by the Ottoman Empire in 1429. The Sebilj is a pseudo-Moorish style wooden fountain in the centre of Baščaršija square. Sarajevo as we know it today was founded by the Ottoman Empire in the 1450s upon conquering the region, with 1461 typically used as the city’s founding date. The first Ottoman governor of Bosnia Province, Isa-Beg Ishaković, transformed whatever cluster of villages there was there into a city and state capitol by building a number of key objects, including a mosque, a closed marketplace, a public bath, a hostel, and of course the governor’s castle (“Saray”) which gave the city its present name. The mosque was named “Careva Džamija” (the Tsar’s Mosque) in honor of the Sultan Mehmed II. With the improvements Sarajevo quickly grew into the largest city in the region. Many Christians converted to Islam at this time. The settlement was established as a city, named Bosna-Saraj, around the citadel in 1461. The name Sarajevo is derived from Turkish saray ovası, meaning the field around saray. Under the wise leadership of people such as the second governor Gazi Husrev-beg (the city’s greatest donor who built most of what is now the Old Town) Sarajevo grew at a rapid rate. Sarajevo became known for its large marketplace and numerous mosques, which by the middle of the 16th century were over a hundred in number. At its height, Sarajevo was the biggest and most important Ottoman city in the Balkans after Istanbul itself. By 1660, the population of Sarajevo was estimated to be over 80,000. Comparatively, Belgrade in 1838 had 12,963 inhabitants and Zagreb as late as 1851 had 14,000 people. Things went mostly downhill for Sarajevo from there. In 1699 Prince Eugene of Savoy led a successful raid on Sarajevo. After his men looted all that they could, the city was set on fire. In a mere day, nearly the whole city was destroyed except for a handful of neighborhoods, some mosques, and the orthodox church. Numerous other fires weakened the city as well, so that by 1807 it only had some 60,000 residents. In the 1830s the area around the city was ground to several battles of the Bosnian rebellion, led by Husein Gradaščević. Today, a major city street is named “Zmaj od Bosne” (Dragon of Bosnia) in his honor. The rebellion however, failed, and the crumbling Ottoman state remained in control of Bosnia for several more decades. A plaque commemorating the location of the assassination. In 1697, during the Great Turkish War, a raid was led by Prince Eugene of Savoy of the Habsburg Monarchy against the Ottoman Empire, which conquered Sarajevo and left it plague-infected and burned to the ground. The city was later rebuilt, but never fully recovered from the destruction. The Ottoman Empire made Sarajevo an important administrative centre by 1850, but the ruling powers changed as the Austria-Hungarian Empire conquered Bosnia and Herzegovina in 1878 as part of the Treaty of Berlin, and annexed it completely in 1908. Sarajevo was industrialized by Austria-Hungary, who used the city as a testing area for new inventions, such as tramways, before installing them in Vienna. Architects and engineers who endeavored to rebuild Sarajevo as a modern European capital rushed to the city. They were unexpectedly aided by a fire that burned down a large part of the central city area (čaršija). This has resulted in a unique blend of the remaining Ottoman city market and contemporary western architecture. Sarajevo hosts some shiny examples of Secession and Pseudo-Moorish styles that date from this period. In the event that triggered World War I, Archduke Franz Ferdinand of Austria and his wife Sophie, Duchess of Hohenberg, were assassinated in Sarajevo on 28 June 1914 by a self declared Yugoslav, Gavrilo Princip. In the ensuing war, however, most of the Balkan offensives occurred near Belgrade, and Sarajevo largely escaped damage and destruction during the war. Following the war, after the Balkans were unified under the Kingdom of Yugoslavia, Sarajevo became the capital of the Drina Province. In World War II, the city became a part of the Independent State of Croatia after the Axis invasion of Yugoslavia. The city was bombed by the Allies from 1943 to 1944. The Eternal flame is a memorial to the military and civilian victims of the Second World War. After World War I and liberation by Serbian army ,Sarajevo became part of the Kingdom of Yugoslavia. Though it held some political importance, as the center of first the Bosnian region and then the Drinska Banovina, it was not treated with the same attention or considered as significant as it was in the past. Outside of today's national bank of Bosnia and Herzegovina, virtually no significant contributions to the city were made during this period. During World War II the Kingdom of Yugoslavia put up an inadequate defense. Following a German bombing campaign, Sarajevo was captured on the 15th April 1941 by the 16th Motorized infantry Division. Shortly after the fall, the city, like many other Yugoslav areas, formed a strong partisan movement. Sarajevo's resistance was led by a NLA Partisan named "Walter" Perić. He died while leading the final liberation of the city on the 6th of April 1945 and became famous for his actions shortly afterwards. Many of the WWII shell casings that were used during the attacks have been carved and polished in Sarajevo tradition and are sold as art. Following the liberation, Sarajevo was the capital of the republic of Bosnia and Herzegovina within the Socialist Federal Republic of Yugoslavia. The communists invested heavily in Sarajevo, building many new residential blocks in Novi Grad Municipality and Novo Sarajevo Municipality, while simultaneously developing the city's industry and transforming Sarajevo once again into one of the Balkans' chief cities. From a post-war population of 115,000, by the end of Yugoslavia Sarajevo had 429,672 people. Sarajevo grew rapidly as it became an important regional industrial center in Yugoslavia. Modern communist-city blocks were built west of the old city, adding to Sarajevo's architectural uniqueness. The crowning moment of Sarajevo’s time in Socialist Yugoslavia was the 1984 Winter Olympics. Sarajevo beat out Sapporo, Japan; and Falun/Göteborg, Sweden for the privilege. They were followed by an immense boom in tourism, making the 1980s one of the city's best decades in a long time. Sarajevo as seen from a SPOT satellite. Sarajevo is located near the geometric center of the triangular-shaped Bosnia-Herzegovina and within the historical region of Bosnia proper. It lies in the Sarajevo valley, in the middle of the Dinaric Alps. The valley itself once formed a vast expanse of greenery, but gave way to urban expansion and development in the post-World War II era. The city is surrounded by heavily forested hills and five major mountains. The highest of the surrounding peaks is Treskavica at 2,088 meters (6,850 ft), then Bjelašnica at 2,067 meters (6,781 ft), Jahorina at 1,913 meters (6,276 ft), Trebević at 1,627 meters (5,338 ft), with 1,502 meters (4,928 ft) Igman being the shortest. Last four are also known as Olympic Mountains of Sarajevo (see also 1984 Winter Olympics). On average, Sarajevo is situated 500 meters (1,640 ft) above sea level. The city itself has its fair share of hilly terrain, as evidenced by the many steeply inclined streets and residences seemingly perched on the hillsides. The Miljacka river is one of the city's chief geographic features. It flows through the city from east through the center of Sarajevo to west part of city where eventually meets up with the Bosna river. Miljacka river is "The Sarajevo River", with its source in the town of Pale, several kilometers to the east of Sarajevo. The Bosna's source, Vrelo Bosne near Ilidža (west Sarajevo), is another notable natural landmark and a popular destination for Sarajevans and other tourists. Several smaller rivers and streams also run through the city and its vicinity. Sarajevo has a continental climate, lying between the climate zones of central Europe to the north and the Mediterranean to the south. The proximity of the Adriatic Sea moderates Sarajevo's climate somewhat, although the mountains to the south of the city greatly reduce this maritime influence. The average yearly temperature is 9.5 °C, with January (−1.3 °C (29.7 °F) avg.) being the coldest month of the year and July (19.1 °C (66.4 °F) avg.) the warmest. The highest recorded temperature was 40.0 °C (104 °F) on 19 August 1946, while the lowest recorded temperature was −26.4 °C (−15.5 °F) on 25 January 1942. On average, Sarajevo has 68 summer days per year (temperature greater than or equal to 30.0 °C). The city typically experiences mildly cloudy skies, with an average yearly cloud cover of 59%. The cloudiest month is December (75% average cloud cover) while the clearest is August (37%). Moderate precipitation occurs fairly consistently throughout the year, with an average 170 days of rainfall. Suitable climatic conditions have allowed winter sports to flourish in the region, as exemplified by the Winter Olympics in 1984 that were celebrated in Sarajevo. Sarajevo is the capital of the country of Bosnia and Herzegovina and its sub-entity, the Federation of Bosnia and Herzegovina, as well as of the Sarajevo Canton. It is also the de jure capital of another entity, Republika Srpska. Each of these levels of government has their parliament or council, as well as judicial courts, in the city. In addition many foreign embassies are located in Sarajevo. Bosnia and Herzegovina's Parliament office in Sarajevo was damaged heavily in the Bosnian war. Due to damage the staff and documents were moved to a nearby ground level office to resume the work. In late 2006 reconstruction work started on the Parliament and is to be finished in early 2007. The cost of reconstruction is supported 80% by the Greek Government through the Hellenic Program of Balkans Reconstruction (ESOAV) and 20% by Bosnia-Herzegovina. 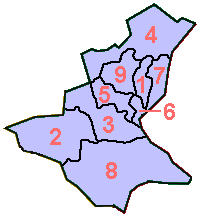 The four municipalities Centar, Novi Grad, Novo Sarajevo, and Stari Grad. The city comprises four municipalities Centar, Novi Grad, Novo Sarajevo, and Stari Grad. Each operate their own municipal government, united they form one city government with its own constitution. The executive branch (Bosnian: Gradska Uprava) consists of a mayor, with two deputies and a cabinet. The legislative branch consists of the City Council, or Gradsko Vijeće. The council has 28 members, including a council speaker, two deputies, and a secretary. Councilors are elected by the municipality in numbers roughly proportional to their population. The city government also has a judicial branch based on the post-transitional judicial system as outlined by the High Representative's “High Judicial and Prosecutorial Councils”. Sarajevo's Municipalities are further split into "local communities" (Bosnian, Mjesne zajednice). Local communities have a small role in city government and are intended as a way for ordinary citizens to get involved in city government. They are based around key neighborhoods in the city. The building of BOR bank in Sarajevo. After years of war, Sarajevo's economy has been subject to reconstruction and rehabilitation programs. Amongst other economic landmarks, the Central Bank of Bosnia and Herzegovina opened in Sarajevo in 1997 and the Sarajevo Stock Exchange began trading in 2002. The city's large manufacturing, administration, and tourism base, combined with a large informal market, makes it one of the strongest economic regions of Bosnia and Herzegovina. While Sarajevo had a large industrial base during its communist period, only a few pre-existing businesses have successfully adapted to the market economy. Sarajevo industries now include tobacco products, furniture, hosiery, automobiles, and communication equipment. Companies based in Sarajevo include B&H Airlines, BH Telecom, Bosnalijek, Energopetrol, Sarajevo Tobacco Factory, and Sarajevska Pivara (Sarajevo Brewery). Sarajevo has a strong tourist industry and was named by Lonely Planet the 43rd Best City in the World in 2006. Sports-related tourism uses the legacy facilities of the 1984 Winter Olympics, especially the skiing facilities on the nearby mountains of Bjelašnica, Igman, Jahorina, Trebević, and Treskavica. Sarajevo's 600 years of history, influenced by both Western and Eastern empires, is also a strong tourist attraction. Sarajevo has hosted travellers for centuries, because it was an important trading center during the Ottoman and Austria-Hungarian empires. Examples of popular destinations in Sarajevo include the Vrelo Bosne park, the Sarajevo cathedral, and the Gazi Husrev-beg's Mosque. Tourism in Sarajevo is chiefly focused on historical, religious, and cultural aspects. The 14th century Bosnian king Tvrtko Kotromanić, is seen as an important aspect of the heritage of Bosniak people and Bosnians in general. The last official census in Bosnia and Herzegovina took place 1991 and recorded 527,049 people living in city of Sarajevo (ten municipalities). In the settlement of Sarajevo itself were 416,497 inhabitants. The war displaced hundreds of thousands of people, many of whom have not returned. Today, Sarajevo's population is not known clearly and is based on estimates contributed by the United Nations Statistics Division and the Federal Office of Statistics of the Federation of Bosnia and Herzegovina, among other national and international non-profit organizations. As of June 2009, the population of the city's four municipalities is estimated to be 305,242, whereas the Sarajevo Canton population is estimated at 423,645. With an area of 493 square miles (1,280 km2), Sarajevo has a population density of about 2,173 inhabitants per square kilometre (5,630 /sq mi) The Novo Sarajevo municipality is the most densely populated part of Sarajevo with about 7,524 inhabitants per square kilometre (19,490 /sq mi), while the least densely populated is the Stari Grad, with 2,742 inhabitants per square kilometre (7,100 /sq mi). War changed the ethnic and religious profile of the city. It had for long been a multicultural city, and usually carried the epithet of "Europe's Jerusalem". In 1991, Muslims Bosniaks formed 45% of the population, followed by Eastern Orthodox Serbs with 38%, and Roman Catholic Croats with 7%. Today, only about 18,000 Serbs (and practically insignificant number of Croats) remain in Sarajevo. Sarajevo's location in a valley between mountains makes it a compact city. Narrow city streets and a lack of parking areas restrict automobile traffic but allow better pedestrian and cyclist mobility. The two main streets are Titova street (Street of Marshal Tito) and the east-west Zmaj od Bosne (Dragon of Bosnia) highway. The trans-European highway, Corridor 5C, runs through Sarajevo connecting it to Budapest in the north, and Ploče in the south. Electric tramways, in operation since 1885, are the oldest form of public transportation in the city. There are seven tramway lines supplemented by five trolleybus lines and numerous bus routes. The main railroad station in Sarajevo is located in the north-central area of the city. From there, the tracks head west before branching off in different directions, including to industrial zones in the city. Sarajevo is currently undergoing a major infrastructure renewal; many highways and streets are being repaved, the tram system is undergoing modernization, and new bridges and roads are under construction. Sarajevo International Airport (IATA: SJJ), also called Butmir, is located just a few kilometers southwest of the city. During the war the airport was used for United Nations flights and humanitarian relief. Since the Dayton Accord in 1996, the airport has welcomed a thriving commercial flight business which includes the new Sarajevo International on March 2008 221 Countries, cities and airlines. In 2006, 534,000 passengers had travelled through Sarajevo airport, whereas only 25,000 had just 10 years earlier in 1996. As the capital and largest city of Bosnia and Herzegovina, Sarajevo is the main center of the country's media. Most of the communications and media infrastructure was destroyed during the war but reconstruction led by the Office of the High Representative have helped modernize the industry. For example, internet was first made available to the city in 1995. Oslobođenje (Liberation), founded in 1943, is Sarajevo longest running newspaper and the only one to survive the war. However, this long running and trusted newspaper has fallen behind the Dnevni Avaz (Daily Voice), founded in 1995, and Jutarnje Novine (Morning News) in circulation in Sarajevo. Other local periodicals include the Croatian newspaper Hrvatska riječ and the Bosnian magazine Start, as well as weekly newspapers Slobodna Bosna (Free Bosnia) and BH Dani (BH Days). Novi Plamen, a monthly magazine, is the most left-wing publication currently. The Radiotelevision of Bosnia-Herzegovina is Sarajevo's public television station, one of three in Bosnia and Herzegovina. Other stations based in the city include NRTV “Studio 99”, NTV Hayat, Open Broadcast Network, TV Kantona Sarajevo and Televizija Alfa. Many small independent radio stations exist, included established stations such as Radio M, Radio Stari Grad (Radio Old Town), Studentski eFM Radio, Radio 202, Radio BIR, and RSG. Radio Free Europe, as well as several American and West European stations, are available in the city, too. Higher education has a long tradition in Sarajevo. The first institution that can be classified as such was a school of Sufi philosophy established by Gazi Husrev-beg in 1531; numerous other religious schools have been established over time. In 1887, under the Austro-Hungarian Empire, a Sharia Law School began a five-year program. In the 1940s the University of Sarajevo became the city's first secular higher education institute. In the 1950s post-bachelaurate graduate degrees became available. While severely damaged during the war, it was rebuilt in partnership with more than 40 other universities. International universities: Sarajevo School of Science and Technology, International University of Sarajevo, American University in Bosnia and Herzegovina, Sarajevo Graduate School of Business, International Burch University, International University "Philip Noel Baker". University of Sarajevo is in partnership with Griffith College Dublin. In their cooperation they offer course BA in Business Studies. First two years are in Sarajevo, and third, the final one, is in Dublin. After finishing this course students are receiving Diploma from both universities. Also, one-year MBA in International Business Management is offered at University of Sarajevo, after finishing this course students are receiving Diploma from University of Sarajevo, Griffith College Dublin and Nottingham Trent University. The 'Druga gimnazija' provides the International Baccalaureate diploma. 'Prva bošnjačka gimnazija' provides IGCSE and GCE Advanced Level. Sarajevo has been home to many different religions for centuries, giving the city a range of diverse cultures. In the time of Ottoman occupation of Bosnia, Muslims, Eastern Orthodox, Roman Catholics, and Sephardi Jews all shared the city while maintaining distinctive identities. They were joined during the brief occupation by Austria-Hungary by a smaller number of Germans, Hungarians, Slovaks, Czechs and Ashkenazi Jews. As a result of the war, today the city is primarily Bosniak, however, but in recent years many refugees have returned, and there are a growing number of illegal immigrants from Eastern Asia. Historically, Sarajevo was home to several famous Bosnian poets, scholars, philosophers, and writers during the Ottoman Empire. To list only a few; Nobel Prize-winner Vladimir Prelog is from the city, as is Academy Award-winning director Danis Tanović. Nobel Prize-winner Ivo Andrić attended high school in Sarajevo for two years. The National Museum of Bosnia and Herzegovina, in Sarajevo. The city is rich in museums, including the Museum of Sarajevo, the Ars Aevi Museum of Contemporary Art, the National Museum of Bosnia and Herzegovina (established in 1888 and home to the Sarajevo Haggadah), the Historical Museum of Bosnia and Herzegovina, and the Museum of Literature and Theatre Arts of Bosnia and Herzegovina. The city also hosts the National theatre of Bosnia and Herzegovina, established in 1919, as well as the Sarajevo Youth Theatre. Other cultural institutions include the Center for Sarajevo Culture, Sarajevo City Library, Art Gallery of Bosnia and Herzegovina, and the Bosniak Institute, a privately owned library and art collection focusing on Bosniak history. Demolitions associated with the war, as well as reconstruction, destroyed several institutions and cultural or religious symbols including the Gazi Husrev-beg library, the national library, the Sarajevo Oriental Institute, and a museum dedicated to the 1984 Olympic games. Consequently, the different levels of government established strong cultural protection laws and institutions. Bodies charged with cultural preservation in Sarajevo include the Institute for the Protection of the Cultural, Historical and Natural Heritage of Bosnia and Herzegovina (and their Sarajevo Canton counterpart), and the Bosnia and Herzegovina Commission to Preserve National Monuments. The Sarajevo school of pop rock developed in the city between 1961 and 1991. This type of music began with bands like Indexi, Pro Arte and singer/song writer Kemal Monteno. It continued into the 1980s, with bands such as Plavi Orkestar, and Crvena Jabuka, ending with the war in 1992. Sarajevo was also the birthplace of the most popular Yugoslav rock band of all time, Bijelo Dugme, somewhat of a Bosnian parallel to the Rolling Stones, in both popularity and fame. Sarajevo was also the home of a very notable post-punk urban subculture known as the New Primitives, which began during the early 1980s and was brought into the mainstream through bands such as Zabranjeno Pušenje and Elvis J. Kurtović & His Meteors, as well as the Top Lista Nadrealista radio, and later television show. Other notable bands considered to be part of this subculture are Bombaj štampa and Šume i Gore. Besides and separately from the New Primitives, Sarajevo is the hometown of one of the most significant ex-Yugoslavian alternative industrial-noise bands, SCH (1983-current). The Sarajevo Film Festival, established in 1995, has become the premier film festival in the Balkans. The Sarajevo Winter Festival, Sarajevo Jazz Festival are well-known, as is the Baščaršija Nights festival, a month-long showcase of local culture, music, and dance. The Sarajevo Film Festival has been hosted at the National Theater, with screenings at the Open-air theater Metalac and the Bosnian Cultural Center, all located in downtown Sarajevo and has hosted such world-renowned actors, directors, and musicians as: Steve Buscemi, Bono, Coolio, John Malkovich, Nick Nolte, Daniel Craig, Willem Dafoe, Anthony Minghella, Katrin Cartlidge, Alexander Payne, Sophie Okonedo, Stephen Frears, Michael Moore, Darren Aronofsky, Mickey Rourke, Gillian Anderson, Kevin Spacey, and many other major cultural figures from the Balkans, Europe, and the Americas. In the past thirteen years, the festival has entertained people and celebrities alike, elevating it to an international level. The first incarnation of the Sarajevo Film Festival was hosted in still-warring Sarajevo in 1995, and has now progressed into being the biggest and most significant festival in South-Eastern Europe. A talent campus is also held during the duration of the festival, with numerous world-renowned lecturers speaking on behalf of world cinematography and holding workshops for film students from across South-Eastern Europe. The Sarajevo Jazz Festival has been entertaining Jazz connoisseurs for over ten years and has hosted such artists as Richard Bona, The John Butler Trio, Cristina Branco, Dhafer Youssef, and many more. The festival takes place at the Bosnian Cultural Center (aka "Main Stage"), just down the street from the SFF, at the Sarajevo Youth Stage Theater (aka "Strange Fruits Stage", at the Dom Vojske Federacije (aka "Solo Stage"), and at the CDA (aka "Groove Stage"). The city was the location of the 1984 Winter Olympics. Yugoslavia won one medal, a silver in men's giant slalom awarded to Jure Franko. Many of the Olympic facilities survived the war or were reconstructed, including Olympic Hall Zetra and Asim Ferhatović Stadion. After co-hosting the Southeast Europe Friendship games, Sarajevo was awarded the 2009 Special Olympic winter games, but cancelled these plans. Football (soccer) is popular in Sarajevo; the city hosts FK Sarajevo and FK Željezničar, which both compete in European and international cups and tournaments and are have a very large trophy cabinet in the former Yugoslavia as well as independent Bosnia and Herzegovina. Other notable soccer clubs are FK Olimpik and SAŠK. Another popular sport is basketball; the basketball club KK Bosna Sarajevo won the European Championship in 1979 as well as many Yugoslav and Bosnian national championships making it one of the greatest basketball clubs in the former Yugoslavia. The chess club, Bosna Sarajevo, has been a championship team since the 1980s and is the third ranked chess club in Europe, having won four consecutive European championships in the nineties. HC Bosna also competes in the European Champions League and is considered one of the most well organised handball clubs in South-Eastern Europe with a very large fan base and excellent national, as well as international results. Sarajevo often holds international events and competitions in sports such as tennis and kickboxing. Rock climbing is popular; rock-climbing events and practices are held at Sarajevo's Dariva area, where there is also an extensive network of biking trails. Popularity of tennis has been picking up in recent years. Since 2003, BH Telecom Indoors is an annual tennis tournament in Sarajevo. ^ a b "First release". Federal Office of Statistics, Federation of Bosnia and Herzegovina. 2009-09-09. http://www.fzs.ba/saopcenja/2009/14.2.1.pdf. Retrieved 2009-11-02. ^ a b "Intercity and International Cooperation of the City of Zagreb". © 2006-2009 City of Zagreb. http://www1.zagreb.hr/mms/en/index.html. Retrieved 2009-06-23. ^ Malcolm, Noel. Bosnia: A Short History. ISBN 0-81475-561-5. ^ a b Stilinovic, Josip (3 January 2002). In Europe's Jerusalem Catholic World News. Retrieved on 5 August 2006. ^ a b Lonely Planet (March 2006). The Cities Book: A Journey Through The Best Cities In The World. Lonely Planet Publications, ISBN 1-74104-731-5. ^ Kelley, Steve. Rising Sarajevo finds hope again. The Seattle Times. Retrieved on 19 August 2006. ^ "Lonely Planet's Top 10 Cities 2010 | Lonely Planet's Top 10 Cities 2010". News.com.au. http://www.news.com.au/travel/galleries/gallery-e6frflw0-1225794915428?page=2. Retrieved 2010-01-19. ^ Tourism Association of Sarajevo Canton. The Culture & History. World Weather - Average Conditions. Retrieved on 3 August 2006. ^ Bosnia and Herzegovina Commission to Preserve National Monuments. II – PROCEDURE PRIOR TO DECISION. Roman remains at Ilidža, the archaeological site - Elucidation. Retrieved on 3 August 2006. ^ a b c New Britannica, volume 10, edition 15 (1989). Sarajevo. ISBN 0-85229-493-X. ^ The Columbia Encyclopedia, edition 6. Sarajevo. Retrieved on 3 August 2006. ^ FICE (International Federation of Educative Communities) Congress 2006. Sarajevo - History. Congress in Sarajevo. Retrieved on 3 August 2006. ^ Lacan, Igor; McBride, Joe R. (2009). "War and trees: The destruction and replanting of the urban and peri-urban forest of Sarajevo, Bosnia and Herzegovina". Urban Forestry & Urban Greening 8 (3): 133–148. doi:10.1016/j.ufug.2009.04.001. ^ "Sarajevo, BIH Weather". MSN. http://weather.msn.com/local.aspx?wealocations=wc:BKXX0004. Retrieved 2008-12-23. ^ a b c d e f g h daenet d.o.o.. "Sarajevo Official Web Site : Sister cities". Sarajevo.ba. http://www.sarajevo.ba/en/stream.php?kat=160. Retrieved 2009-05-06. ^ "Official portal of City of Skopje - Skopje Sister Cities". © 2006-2009 City of Skopje. http://www.skopje.gov.mk/EN/DesktopDefault.aspx?tabindex=0&tabid=69. Retrieved 2009-07-14. ^ "Sister Cities of Istanbul". http://www.greatistanbul.com/sister_cities.htm. Retrieved 2007-09-08. ^ Erdem, Selim Efe (2003-11-03). "İstanbul'a 49 kardeş" (in Turkish). Radikal. http://www.radikal.com.tr/haber.php?haberno=94185. "49 sister cities in 2003"
^ "Sister City - Budapest". Official website of New York City. http://www.nyc.gov/html/unccp/scp/html/sc/budapest_main.shtml. Retrieved 2008-05-14. ^ "Official Barcelona Website: Sister Cities". © Ajuntament de Barcelona 1995-2008. http://w3.bcn.es/XMLServeis/XMLHomeLinkPl/0,4022,229724149_257215678_1,00.html. Retrieved 2008-11-11. ^ European Commission & World Bank. The European Community (EC) Europe for Sarajevo Programme The EC reconstruction programme for Bosnia and Herzegovina detailed by sector. Retrieved on 5 August 2006. ^ CIA (2006). Bosnia and Herzegovina CIA World Factbook. Retrieved on 5 August 2006. ^ Sarajevo Canton. Population Density by Municipalities of Sarajevo Canton. About Canton. Retrieved on 5 August 2006. ^ Bosmal. Corridor 5C. Retrieved on 5 August 2006. ^ Krkic, Zahid The airport is also seeing new airlines begin operation; such as British Airways, which operates direct flights to London as of 2007 , and many other European airlines will begin operation in Butmir. soon/Statistics data for Sarajevo Airport. Retrieved on 5 August 2006. ^ European Journalism Centre (November 2002). The Bosnia-Herzegovina media landscape. European Media Landscape. Retrieved on 5 August 2006. ^ Vockic-Avdagic, Jelenka. The Internet and the Public in Bosnia-Herzegovina in Spassov, O. and Todorov Ch. (eds.) (2003), New Media in Southeast Europe. SOEMZ, European University "Viadrina" (Frankfurt - Oder) and Sofia University"St. Kliment Ohridski". ^ Udovicic, Radenko (03-05-2002). What is Happening with the Oldest Bosnian-Herzegovinian Daily: Oslobođenje to be sold for 4.7 Million Marks Mediaonline.ba: Southeast European Media Journal. ^ Sarajevo Canton, 2000 Primary Education & Secondary EducationPDF (1.28 MB). Sarajevo 2000, p107–08. ^ "Ecole française MLF de Sarajevo : News". Efmlfsarajevo.org. http://www.efmlfsarajevo.org/news/news.php. Retrieved 2010-01-19. ^ Perlez, Jane (12 August 1996). Ruins of Sarajevo Library Is Symbol of a Shattered Culture New York Times. ^ "Sarajevo Film Festival - Filmski Festivali - Filmski.Net". Filmski.net. http://www.filmski.net/festivali/25/sarajevo_film_festival. Retrieved 2008-11-01. ^ Special Olympics, (2005 - Quarter 2). 2009 Games in SarajevoPDF (277 KB) Spirit. Retrieved on 5 August 2006. ^ Hem, Brad (29 July 2006). Idaho may be in the running to host the 2009 Special Olympics IdahoStatesman.com. ^ Special Olympics (May 2006). Boise, Idaho (USA) Awarded 2009 Special Olympics World Winter Games Global News. Local Bosnian Cultural Programs - Tourism Development Portal setup by IFC of World Bank group to promote tourism in local villages. Sarajevo is a capital of Bosnia and Herzegovina. The city is famous for its traditional religious diversity, with adherents of Islam, Catholicism, Orthodoxy, and Judaism peacefully coexisting there for centuries. In 1914 it was the site of the assassination that sparked World War I.
Sarajevo , the capital of Bosnia and Herzegovina, is a lively city of 400,000 people, nestled in a valley, mainly within the Federation of Bosnia and Herzegovina, but with parts in the Republika Srpska entity. The bridge in Sarajevo is directly across the street from where Arch Duke Franz Ferdinand was killed by a Serbian assassin that set in motion the beginning of WWI. A historical marker is located at the bridge entrance on the left side of this picture. Another marker is on the building adjacent to the spot where the assassination took place across the street. Sarajevo is one of the most historically interesting cities in Europe. It is the place where the Western & Eastern Roman Empire split; where the people of the Roman Catholic west, Eastern Orthodox east and the Ottoman south, met, lived and warred. It has been both an example of historical turbulence and the clash of civilizations, as well as a beacon of hope for peace and tolerance through multi-cultural integration. Today the city has physically recovered from most of the war damage caused by the Yugoslav Wars of the 1992-1995. Sarajevo is a cosmopolitan European capital with a unique Eastern twist that is a delight to visit. The people are very friendly, be they Bosniaks, Croats, or Serb. There is very little crime. Also there are not nearly as many tourists as on the Croatian Dalmatian coast and a wealth of architecture (not to mention history) to see. The city is very tourist friendly - once you get to the city center. There is a tourist info office in the center of town, take the #1 tram in front of the station and it will take you to town or just walk for about 20 min going right out of the train station and follow the river. Tram #1 will follow the river up until Bascarsija square (in the turkish quarter) where it will make a 180 degree turn and drive back towards the station. The Bascarsija tram stop is located directly after the tram turns away from the river. Sarajevo Airport  (IATA: SJJ) is in the suburb of Butmir and is relatively close to the city centre. Getting to/from the airport can be problematic: there is no direct public transportation, and taxi fares to/from the airport are surprisingly expensive for the short distance - your best bet is to take a taxi to the tram terminus at Ilidža and board the tram for the last part of your journey, cost 1.6KM. Alternatively you can take bus 36 to Nedžarići (1.6KM), the bus stop is located somewhere on the main road outside the airport parking lot. At Nedžarići you can change for a tram to the city center (again 1.8KM). Bus 36 runs about every 30 minutes. Service hours are 6-23 Mon-Fri, 6-8 and 14-18 Sat and 8-15 Sun. Train services across the country are slowly improving once again, though speeds and frequencies are still much lower than usual European standards. Much of the rail infrastructure was damaged during the recent conflict, and lines have been opened on a priority basis, though not to the high level of service pre-war. From/To Hungary A day train now leaves Budapest (Keleti pu. station) daily at 9.45, arriving in Sarajevo at 21.09. One-way ticket costs more than the return ticket which is currently costs around €51 (14.040) forints at actual HUF to Euro rate of €1 = 270 HUF. There is a dining car, but only till Pécs. Typically, it departs from platform 13. You will be bothered at least four times for your passport, and around four times for your ticket, and once by very nosy and insistent EU customs staff. The return train departs at 7:02 every morning for Budapest, via Osijek, in Croatia, and costs 96 KM. It arrives at Keleti pu. station at 18:14. For more information visit Hungarian Timetable  or Hungarian State Railways . From/To Serbia It is possible to buy a night-train ticket Sarajevo to Belgrade and vice versa. There is a short transfer to a different train at the Doboj stop in Bosnia. The train takes 9 hours from Sarajevo to Belgrade, and 11 hours from Belgrade to Sarajevo. There are no sleeping cars available. You will be bothered at least four times for your passport (since the train crosses through a small piece of Croatia), and at least as many times for your ticket. Do not expect to be able to sleep. You can also use the daytime train to Budapest and change in Croatian station Strizivojna-Vrpolje to the connecting train to Belgrade. This train also has a dining car. Travelling daytime should be more relaxing. There are two trains each day between Sarajevo and Zagreb. The return train to Zagreb, via Zenica, Doboj and Banja Luka, departs at 10:27 (having started in Ploče at 06:00). It arrives in Banja Luka at 15:24 and finally into Zagreb at 19:45. A ticket should cost around 30 EUR, more precisely 225,43KN (July 2009). A return ticket is cheaper, costing around 260KN or 50 Euros. The train does NOT have a dining car on board, though men with trolleys selling food and drink will board the train at various points on the journey. Be advised to bring supplies beforehand! There is now also a overnight service operating between the two cities for the same price. Whilst this train occasionally operates with a couchette car, the inconveniently-timed border crossing from Sarajevo to Zagreb (ensuring you won't get a full night's sleep) remains! Travelling on this train has the benefit of comfort (as opposed to the bus journey taking almost the same time), or the cost factor of flying and a night's accommodation in either city. Be careful (as with all overnight rail travel in Europe), that thieves may operate on the train, robbering passports, money and mobile phones. This train leaves Zagreb at 21:25 arriving in Sarajevo at 06:39. The return train leaves Sarajevo at 21:20 and arrives in Zagreb at 06:42. See below for trains to/from Ploče. There is another train route from Ploče in Croatia to Sarajevo via Mostar. One of the most beautiful and scenic rail routes in Europe, travelling through lakes and mountains with many tunnels and switchbacks. Single tickets from Sarajevo to Mostar cost 9.90KM (return: 14.10KM). Additional trains operate each day to the town of Konjic (about half way between the two cities). Holders of an ISIC student card can get a 30% discount. See the Croatian Railways website  for more information. Roads in Bosnia are often only a single lane in either direction, and due to the mountainous topography tend to be very windy and speed limits are lower (mostly 80kph). Beware of trucks and people dangerously overtaking on any road. There are many tunnels, and you must always drive with your lights ON (day or night). From Adriatic Sea - taking ferry Ancona - Zadar, then by car Zadar - Split - Metkovic - Mostar - Sarajevo. From Belgrade (Serbia) - taking direction to Sabac - Zvornik - Vlasenica - Sokolac - Sarajevo. There is a company which offers connections by mini-van or private cars between Sarajevo and Belgrade, the name of the company is GEA Tours, the company is based in Belgrade and Podgorica. It is compulsory to contact before the departure either by phone or by email. The Belgrade office telephone number is +381 11 2686-635,2686-622,2643-840,2685-043, the address is Kneza Milosa 65-Belgrade, the email is: gea@eunet.rs. A single journey between Sarajevo and Belgrade costs €30 and it takes about 5 hours and a half to 6 hours. There are two bus stations in Sarajevo. The main bus station ('autobusna stanica', by the train station) serves Croatia and most other international destinations, as well as destinations within the Federation of Bosnia and Herzegovina. It is in the end of number 1 tram line that takes you to the old town (1.80 KM). There is also another bus station in Eastern (Serb-dominated) Sarajevo on the outskirts of the city serving the Republika Srpska and destinations in both Serbia and Montenegro. To get to this bus station (called 'Lukavica' or 'Istočno (Источно) Sarajevo') it is probably easiest to book/order a taxi (cost from the Turkish Quarter was around 15KM in September 2005). If you prefer public transport, use 103 and 107 bus/trolleybus, or the 31E, exit at the last station, and ask people how to get to Lukavica bus station (buses and trolleybuses to the city centre depart from a terminal around 200m from where the international buses arrive). Be warned that Lukavica is the name of suburb/district, not just the bus station! In this bus station, Cyrillic script is prevalent so you should probably check the spelling of your destination. If you need Bosnian currency there is a Visa/Mastercard cash machine (bankomat) in the nearby Pom shopping centre. At the main street in central Sarajevo there is an Eurolines office where is possible to get bus tickets to any other country, also it is possible to get ticket to any other major cities in Bosnia like Mostar although they do not run the services, they only provide the tickets. A ticket to Zagreb costs €30, May 2008 prices and it runs three times a day. Lines tend to be much shorter, and the staff have a much stronger command of English. This can be helpful as if you do not speak Bosnian well, it can be rather hard to get good advice from the bus station. Double-check with the tourist office as they can often confirm the existence of a route or timetable that the staff at the bus station have denied! From the main bus station, there are several buses a day to/from Mostar which also stop at Konjic and Jablanica along the way. These leave at 6, 7, 7:35, 8, 8:15, 9, 9:30, 10:30, 11:30, 12:30, 14:30, 15:30 and up to 18, and journey time is approximately two and a half hours. Single tickets cost 13.50KM, return tickets are 19KM. There are also buses to Split (5-6 hours) and a daily bus to Dubrovnik which leaves at 7AM and costs 40KM/160KN. There are several buses a day from the main bus station to Banja Luka. These leave at 5:00, 07:55, 09:15, 14:30, 15:30 and 16:30. Journey time is approximately 5 hours. The bus ride from Lukavica bus station to Podgorica in Montenegro takes 7 hours but is an absolutely amazing ride through some wonderful countryside on the route Lukavica-Trnovo-Rataj-Foca-Brod-Hum-Goransko-Niksic-Danilovgrad-Podgorica. As of September 2009, buses leave at 8:15, 9:00, 14:00 and 22:30. Cost is 35 KM (July 2008), which is about 18 Euro. Cost is about 40KM (Sept 2009) to Budva. Payment in Euro is accepted. Buses to Tuzla leave from the main bus station approximately every hour every day. The journey takes approximately 3 hours, and costs around 11 KM (June 2006). There is a daily bus to Graz and Vienna (Centrotrans/Eurolines), leaving from the main bus station at 8AM, reaching Graz at 7:45PM and Vienna around 2 hours later. A one-way ticket is €44 (note that when I asked for a cheaper student ticket, the seller told me that this includes only Bosnian students). You will have to pay the driver 2 KM to transport luggage. There are frequent stops on the way, including for food and toilets. Do not rely on this "food stops" very much as the drivers stop at the places like local coffee etc. The problem is that it is not any petrol station and you have to have the currency of the country where you are. The longest 30 min. stop is at one village local coffee in Croatia, and if you don't have any Croatian money, you'll be waiting in front of the bus for 30 min. unable to buy anything but coffee or non-alcoholic drinks. Do not waste your time in Sarajevo if you want to travel with Eurolines and buy your ticket ASAP because the buses to European Union use to be very crowded. Travel to Kosovo from Sarajevo is possible, but one must book a bus to Novi Pazar in Serbia first, and then travel from there to Pristina. The journey to Belgrade goes through amazing scenery, takes about 7-9 hours and was 28 KM (bought from the bus driver) in September 2005. The bus departs from Lukavica bus station in Eastern Sarajevo. There are several buses a day. As of April 2007, there is now a daily service from the main bus station, cost 35 KM. There are many bus lines linking most towns and cities in Bosnia and Hercegovina. See Centrotrans  for details (in Bosnian only). Check the transport sections of other destinations for more information. From Germany you can go by Euroliner (Centrotrans is part of it), have a look on Touring.de . On all intercity buses you pay a fee for luggage. This fee of €1 per piece of luggage is paid to the driver upon boarding. Some drivers are rather picky about being paid in exact change in the correct currency (sometimes a local currency, at other instances requesting to be paid in Euros) and sometimes also refuse to be paid in too small coins. So keep some change ready. The center of Sarajevo is served by a spinal tram network which makes an anti-clockwise loop around the central district (the first in the Austro-Hungarian Empire, opened in the mid-1870s) and a number of trolley-bus and bus lines which fan out into the suburbs. Tickets should be purchased in advance from kiosks labeled tisak on the street or from the driver, where they cost slightly more (around 1.80KM). Tickets should be validated upon boarding the vehicle and are valid for a one way trip only. Changing tram or bus means validating a new ticket. A day card valid for unlimited travel on all local public transport in zone A is available for about 5KM. Please note that inspectors board public transport very frequently. The local transit network is operated by GRAS. More information including timetables can be found at the website: . To reach the Tunnel museum in Butmir you can take the tram to the terminus at Ilidža and change there for bus 32 to Butmir. Leave the bus at Butmir, where the bus turns around to go back, near two small graveyards. From there you cross the bridge on your left hand facing the airport into tuneli street. A better option could be to catch a taxi from the tram terminal. In Sarajevo, street signs are few and far between, and small and on the sides of buildings too far away to see when you're standing on a street corner. Building numbers are more or less consecutive but don't follow the "hundreds" styles of the United States, e.g., 23 Bjestiva street may be blocks from 27 Bjestiva street. An excellent map of Sarajevo is available at bookstores, all of which are located downtown and not open early or late or on holidays. Maps aren't sold in gas stations or other stores. Alternatively, the kiosk next to the Latin Bridge (a.k.a. the Princip Bridge) also sells maps. Lastly, asking Sarajevans for directions is an exercise in futility. People don't know the names of streets a block from the building they've lived in all their lives. However, they won't tell you this, and as a rule will point you in some direction, usually not the right direction. Taxi drivers can't be expected to find anything but the most obvious addresses unless you tell them where to go, in Bosnian. So buy the map before you go to Sarajevo, and when you get there walk around a bit instead of taking taxis. It's a small, beautiful city with many landmarks. Getting lost is next to impossible if you have the map, and maybe a compass. Be careful taking taxis from the main train or bus station and the airport. The well-known "taxi scam" operates in Sarajevo, where the unsuspecting tourist will be taken to a more expensive hotel than the one he or she has asked to be taken to, and the driver and receptionist will swear that the new arrival is in fact in the right place. Many accommodation options, even the cheapest, will offer a pickup from wherever you arrive, and this is usually free or at a very minimal cost. City tour - The local tourist information (Zelenih beretki 22a, +387 33 220 724) has a free brochure called 'A day in Sarajevo', it offers a city tour route and decriptions along that route. Old Town - The cobbled streets, mosques and Oriental style shops at the heart the city are a world away from Europe, and when the call-to-prayer starts, one could be forgiven for thinking that they were actually in the Middle East. The most interesting thing (you call it the most amazing thing as well) is that you could actually be walking by a Catholic church, Orthodox church and a Synagogue and hear the Islamic call to prayer at the same time. Latin Bridge - This bridge bears a plaque commemorating the assassination of Archduke of the Austrian Hungarian empire Franz Ferdinand, the event that sparked the beginning of World War I. On the Bridge itself was a memorial to the assassin Gavrilo Princip, but this was removed during the 1992-1995 War. Bosnia was at the end of World War Two the biggest haven for Balkan and European Jews who found a perfect environment to build their society back. Sarajevo Art Gallery - Small but pleasing gallery. On the third floor of the building south of the Orthodox Cathedral (entrance is down a side street next to the municipal government building, look for the number 8 above the door). Free. Sarajevo's museums are not in a great state of repair, due to disputes over which arm of the government is responsible for funding them. However they are still worth visiting. Bosnian Historical Museum- The moving display on the siege of Sarajevo is a must-see - if you are able to cope with the pictures of the maimed citizens after shelling of markets. Wonder at the photos of an ineffective UN providing armored vehicles citizens could wait behind before risking sniper fire to cross the street. And you will be heartbroken by the pictures drawn by children. In a modern building across the road from the Holiday Inn. National Museum - Statistic displays of the natural and human history of Bosnia and Herzegovina - most interesting is the traditional Turkish style homes of Sarajevo prevalent in the nineteenth century. In a classical building across the road from the Holiday Inn. Closed Mondays. Sarajevo Tunnel Museum - This museum shows the tunnel which was used to ferry supplies into the besieged city during the conflict and is next to the airport. Taxi from the center city costs around 17KM one way. Entrance to the museum is 5KM. It is open 7 days a week from 9 to 5. Get the number three (3) tram to the end of the line from the city center. Then get a taxi to the Tunnel Museum and walk back to the tram station if it's a nice day (takes about half an hour). The tunnel itself is in the garden of a house so don't be worried if you think you're headed into suburbia! Alternatively, the tourist office in the city center offers Tunnel tours for €12 or 24KM, with transportation to and from the city center included. After seeing the tunnel, they also take you on a drive through the part of the city that is in the Republika Srpska, which you can't get to via the tram. Sarajevo City Museum - Newly opened in the Old Town, the museum traces Sarajevo's development from pre-historical times through the Roman, Ottoman, Austro-Hungarian and modern times. A minaret and the hills of Sarajevo. 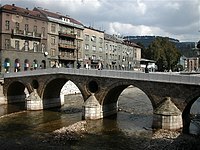 For history buffs - A must see is the "Spanish/Latin Bridge" on the river in downtown Sarajvo. This bridge is where on 28 June 1914 Arch-Duke Fraz Ferdinand of Austria (and his wife Sophie) were assassinated. Historians widely hail this event as the catalyst that began World War I.
Sarajevo's surrounding hills offer fantastic views over the city, but some landmines from the war still exist on some of them. To be safe, stick to paved roads and sidewalks and do not walk into fields, grass, or wooded areas. Also be alert for stray (and possibly rabid) dogs when venturing out of the city. The hills also offer a taste of suburban Bosnian life, including some of the surviving wooden mosques from before the war. If walking up these hills seems too much like hard walk, simply walk up to the old bastion wall and get a view over town from there. Follow the river towards the hills and, where it makes a right hand bend and the main road goes through a tunnel, there's a slip road that goes up, over the tunnel and doubles back towards the bastion. Alternatively, find your way through the war cemetery at the top of the old town. There is now a walking guide to Bosnia's 2000m peaks. It is called Forgotten Beauty and is available from the 'Buy Book' book shop in the center of Sarajevo (In English and Bosnian). Go to famous Olympic Stadium and follow a match of Sarajevo Football Club. Though football quality is low it is interesting to follow a match in a stadium which hosted the opening ceremony of 1984 Sarajevo Winter Olympic Games peacefully just a few years before civil war broke out. Visit one of the many cemeteries located within city limits. With white marble grave stones for those who gave their lives at their 20s during civil war these cemeteries are quite visit worthy. See Markale market place, very close to Bascarcija, which marked the start of NATO intervention and thereby end of the civil war after a Serbian bombing which took the life of some 40, including Croats and Serbs as well. Markale was bombed two times, first in Feb 1994 and second in Aug 1995. First is important in terms of casualties and second is important in terms of initiating NATO military intervention. Vrelo Bosne. The beginning of the river Bosna where the water is pure and ice cold. Here you can walk in a beautiful park, picnic and spend the whole day without ever getting bored.May 01 festival is held here. Look through a solid collection of historiical literature (I bought Death of Yugoslavia here) at the old-school TKD Sahinpasic bookstore on Soukbunar 12. If you can't afford the carpets and local copperware on sale there’s cool t-shirts for 20Km in the souk area – I bought mine (featuring a logo of the 1984 Sarajevo Winter Olympics) at Maloprodaja, Saraci 21. Sarajevo Film Festival, . Held annually during August, the festival has a reputation of being one of the best in Europe (if you compared the funds used). Sarajevo Winter International Festival, . The first festival was held in 1984 during the Olympic Games in Sarajevo. Since then, it has been held regularly each year and brings into the city various artists from around the world. The interesting thing about the festival is that it has never stopped even during the war. Other than the four mentioned festivals, it is important to note that Sarajevo is a vibrant city that lives all year long. The city's regular calendar of events is compiled in a crafty www.sonar.ba to make it easier to plan your visit. Sarajevo has countless shops selling burek (meat pie, sold in layers by weight or by piece), cevapci and pizza stores. Pita (burek, sirnica, krompirusa, tikvenica, zeljanica etc) is a filo type pasty pie generally offered in several varieties - meat (meso), cheese (Bosnian cheese called "young cheese" similar to ricotta and never aged) (sirnica), cheese and spinach (zeljanica), pumpkin (tikvinica), and spicy potato (krompirusa). It is usually served and consumed with a traditional yogurt sauce which resembles sour cream. Most Cevapi places do not serve alcohol. Ago Fast Food Pizzeria, Mula Mustafe Baseskije 17. Bambus, 71000 Sarajevo, #32, Ferhadija bb, 557-190. An amazing jewel of a restaurant in the downtown shopping district. You actually have to go down a small staircase and push a button to be buzzed in to the restaurant but once you are there you will be happy you took the time to find it. It is very classy, quiet, clean, English menu and the waiters speak English. Very good food at good prices. The food is cooked with pride and for the prices charged, it really is a good deal. Bosanska Kuca, Bravadziluk 3, Bascarsija. Seats inside and out in the heart of the old town with a wide range of traditional Bosnian food at reasonable prices. You can sit outside against the warm wall of the oven if it's chilly. Their Muckalica, a veal broth, is delicious and good value at €5. Capucino, Grbavica. Delicious Bosnian meals and the best pasta and pizza in the region. Capucino Restaurant is near river Miljacka in green area. The Hacienda, Bazardzani 3, . Mexican food, cocktails. Stays open late. Large portions at an average of 8-12KM for a main course, with very fresh ingredients and a pleasant atmosphere. Karuzo, Mehmeda Spahe bb. While it doesn't serve traditional Bosnian food, this restaurant features a vegetarian/fish based menu, with a mostly Italian influence (although sushi is also available). The pasta dishes are also highly recommended. Its a very intimate restaurant seating only 18 at a time, the chef takes your order prepares the food and serves it himself. Do be aware that you probably do need to have a good deal of time to spare - it can take a couple of hours before you leave. Mrkva and Zeljo (which has 4 different locations) are the favorite places for the locals to go and get the most Bosnian of meal: Cevapi which are breakfast looking sausage meat patties made with a mixture of ground beef and a special mixture of spices usually kept as the house secret. The patties are grilled to perfection and served in a warm pita-like bread called somun or lepina usually baked in brick ovens. Cevapi are usually accompanied by diced sweet onion and sour cream, although the possibilities are endless. Park Princeva, Iza Hrida br. 7, +387 61 222 708. Slightly more expensive than Inat Kuca, also serving Bosnian food. Located on one of the hills of the city, you have a beautiful view, especially around sunset, when you can hear the prayers from the mosques around the valley. Sarajevo Brewery - A large bar and restaurant near the Latin Bridge. Serves 'western' food, accompanied by a variety of beers brewed on the premises, for example also dark beer. Ottoman Kebap House - Turkish restaurant on a side street in the old town. The inner courtyard lets you eat outside while being away from the noise of the street. The staff are really friendly, and will cook the food to your desired level of spiciness. Entrees are 7-12KM. Sargile are 8-10KM, depending on the flavor. Vegehana - restaurant which also serves as a yoga exercise area. Serves decent daily ajurvedic menu's from 11:00 till 19:00 (Mo-Sa). Before 18:00 its 10KM, after 18:00, 6 KM. , 061-592 123, Kemal-begova 4 , a sidestreet of the Alipašina, not far from the train station. Moja Mala Kuhinja is a small and quaint pilot project restaurant owned by Bosnian celebrity Chef Muamer Kurtagic who has hosted an array of cooking shows on national and privately owned TV stations. The idea is that the whole cooking process is open for public and his customers can enjoy the artistry of cooking the food while being educated at the same time. His menu changes daily according to the availability of the freshest and best tasting organic ingredients. Most dishes served by Chef Muamer are inspired by some of the best restaurant in Germany where he worked and honed his skills for a number of years. The restaurant can only serve 15 guest or so at a time. Baghdad Cafe, Bazardzani 4 (across from Hacienda in Bascarsija), Tel: 033/ 121-121, . Danceclub/hookah bar in one of the most crowded areas of the Old Town for nightlife. Central Cafe, Štrosmajerova 1 in the Bascarsija, Tel: 033/ 200-442  - Cocktail bar with great music. Get there early or call to reserve a table. The place is very busy until midnight when people leave to hit the various nightclubs around town. The street is a whole promenade with many other cafes around. Tre Bicchieri Wine Store & Tasting Bar, Kranjceviceva 8, tel. + 387-33-222654, . Long list of Italian wines. Very cozy and comfortable place. Good music & relaxing atmosphere. Tre Bichierri in Kranjceviceva 8 is closed. The Opera bar/café on B Sarajeva 25, fast WiFi connection, but the waitstaff are often unfriendly and inattentive www.caffebaropera.ba. There are numerous houses around town offering accommodation in rooms for as little as 3KM per night (around 1,5 Euro), although they can be hard to find. Best bet is to go to one of the accommodation bureaus near the old town and find somewhere for a night (at their prices, with their 500% markup), then arrange with the landlord/lady to stay on for their own rate. Hostel & Guesthouse SA is a family-run hostel and a cheap and comfty place to stay in from 10 Euros. It also provides free pick up from the train/bus/airport station. It has an awesome view of the city. Please call Arijan on +387 61 54 89 34 or +387 33 23 88 91. Address: Hrvatin 15, Sarajevo, 71000. Email sa-tourism@hotmail.com. One of the options is local hostel named Sartour . They work in price range from 10 to €15 per person per bed per night for accommodation and can also recommend alternative accommodations. When you get tired of being bundled in cars by various agencies to look at various far-flung and grotty rooms, nip one door down from Sartour's office on Mula Mustafe Bašeskije. Down a passage is an internet cafe with a big sign saying ROOMS - virtually the only one which does actually have rooms right there. They're cheap (30 Euros for a twin room) and cozy and clean enough, you get a little terrace and the staff are very friendly. Can be a bit noisy from the cafe and aircon though, but the location, virtually opposite the central square and right near the tram stop, is perfect. Haris Youth Hostel is one of the most pleasant places to stay in Sarajevo. Although you must walk uphill for about ten minutes from the main square to get there, it is worth the walk for the beautiful view and hospitable, warm atmosphere. This writer has been to Sarajevo three times and truly recommends the hostel. hyh.ba, +387 33 23 25 63. Address: Vratnik Mejdan 29. The owner, a young chap named Haris, also owns a tourism agency right near the pigeon square at Kovaci 7. Hostel City Centre Sarajevo on Gazi Husrev Begova 9 and close to the tourist information in the Old town is a clean and nice place to stay with free cornflakes and kitchen facilities. Book beforehand in summer time (15 euros summer 2009). Nice place at the Miljacka riverside: Pansion SEBILJ, Obala Kulina baba between Careve cuprija and Novi most oposite a tramstation. That place is cheep and clean (15€ per night). Most of the staff is speaking English fluently. An internet-cafe is downstairs in the same house, a restaurant in the atrium. The restaurants in the Old Town, groceries and a pharmacy are all in walking distance. Pansion Sebilj, Bradvadziluk bb, www.pansionsebilj.com.ba . The first address for an overview of budget accommodation of any kind is still 'Sarajevo Accommodation' run by Mersad Bronja, better known as 'Miki'. He arranges overnight stays in private rooms as well as hostels, pensions and hotels in Sarajevo and its surroundings. See their website  for further information. Another good option is the Hostel Ljubičica , situated in the Old town, just next to the tram station (you will often spot backpackers in front). They offer hostel and private accommodations starting at €10 and onwards. Note that the room offered might be a dormitory located in one of several places - it might be along Mule Mustafa ulica, or else up the hill to the east of town. If you are visiting for the first time, you can make arrangements online or by phone, and also arrange with them to be picked up at the train station, or the two bus stations in the city. The friendly and homely Prenociste Kod Keme  is in the heart of Bascarsija and you can get a single room ensuite at the price of €15 per night. If you arrive late at night, the weather is right and you have a tent with you, you can camp quite undisturbedly in the park next to the Miljacka river. Chances are that there already some more tents put up Follow the road on the west side of town, stay close to the river and end up around here. In summer there is a public toilet. Be aware that this is wild camping, and there is no guard or anything. Hotel Konak Mula Mustafe BaşeskijeTake the number 1 tram from the train station to Pigeon Square. Follow the tram tracks west for two blocks, and it will be on your left, look for a red and white sign. Interesting place, as it offers luxury rooms from €100 down to accommodation in a seperate, and quite nice hostel for as low as 15 Euro. Staff are friendly, speak English, and in the off season can be persuaded to negotiate. Hotel amenities include Breakfast, Ensuite bathrooms, Ensuite internet connected computers, while the hostel rooms are double bed privates with satellite television which share a bathroom among three rooms. One of the best value hotels (many approach UK prices) is Motel Sokak, Mula Mustafe Bašeskije 24 Tel:+387 (0)33 570 355 / +387 (0)33 446 344 contact@sokak-motel.com. It's small clean, quiet, friendly and comfortable, in an old building but modern inside. Top marks for location, just down the road from the old town central square and the tram stop. Double is €68 for the room. Pansion Cobanija charges 100KM (€50) per person per night, for a room with a private bathroom and satellite television. The rooms are clean and well-kept, and a continental breakfast is provided. Hotel Michele  This small paradise is probably the best "family" hotel in the city. The staff is wonderfully nice, breakfast and laundry included and also features private parking with direct elevator access to the room floors and wireless high speed internet. Holiday Inn , opm@holiday-inn.ba. While it is part of InterContinental Hotels Group, it is quite unlike Holiday Inns found in the US. A great, classy and beautiful hotel that is a 5 minute walk the train and bus station, and about 10 minutes' walk from the town center. It has clean, safe, nice private rooms with private bathroom and shower, well-maintained. Friendly staff speaks English. They take credit cards and their prices are very good, at €118 per night for two people (low season). The restaurant on the third floor is great. Radon Plaza. Considered the best hotel in the city. It is located at the bottom of Avaz tower, next to the BMW showroom. It is named after the last name of its owner, who is also the owner of Avaz newspaper and one of the cities wealthiest people. The building of former Republic's Executive Council (Government of the Socialist Republic of Bosnia-Herzegovina) in the center of Sarajevo. Its' exterior is completely rebuilt now while new tenants (Ministries of the B&H Council of Ministers - current Government of Bosnia-Herzegovina) are expected to move in early Spring 2007. There are still many minefields and unexploded ordnances in the Sarajevo area and its surrounding suburbs. Never go into damaged buildings ( which are really rare to see) and always stick to paved surfaces avoiding grassy hills that surround the city . Areas that are not cleared are marked by yellow tape or signs, but still not all minefields have been identified due to the lack of resources and the lack of International help. Paved roads are always safe. Crime against foreigners is very rare and the city is safe to visit. (As with any country in former Yugoslavia, be careful not to get into sensitive discussions about politics with people you do not know, but even those can be very educational when you come across a person whose willing to discuss it.) Be aware of pick pockets who usually operate on public transportation vehicles. A final point on health and safety is that the air in Sarajevo can be noticeably thick with pollution, so that asthmatics or those with other chest problems may find themselves short of breath a lot of the time, particularly of a night. Please do ensure you have ample medication, just in case. From Serbo-Croatian Sarajevo, from Ottoman Turkish سرای, Turkish Saray-ovası, from saray "palace" (Persian سرای (sarāy), “‘inn’”) ), and ova "plain, lowland". The capital city of Bosnia and Herzegovina. A canton of Bosnia and Herzegovina. Greek: Σαράγεβο (also Σαράγιεβο) (saráyevo) n.
Macedonian: Сараево mk(mk) (Saráevo) n.
Russian: Сараево ru(ru) (Sarájevo) n.
^ Velikonja, Mitja (2003). Religious Separation and Political Intolerance in Bosnia-Herzegovina, 55, Texas A&M University Press. ^ Tomašević, Nebojša (1983). Treasures of Yugoslavia, 315, Yugoslaviapublic. From Ottoman Turkish سرای, Turkish Saray-ovası, from saray "palace" (< Persian سرای (sarāy), “‘inn’”)), and ova "plain, lowland". Sarajevo is the capital city of Bosnia and Herzegovina . It has a population of 297,672 people (2003). The city has people living in it from a large number of different cultures . It has mosques, synagogues, Catholic churches, and Greek-Orthodox churches. The Olympics in 1984 was held in the Sarajavo. In the Balkan Wars, parts of the city were destroyed. Most of the city is still there or is rebuilt by now. Statatistic data for Sarajevo Airport. Christmas Lights Competition 2007 - YouTube - Broadcast Yourself. Information about Sarajevo, and Bosnia and Herzegovina - VISIT.ba - Free delivery! Discuss travel to Sarajevo with travellers who've been there - eurotrek.net - start here for the best in traveler to traveler help!